METAIRIE, La. 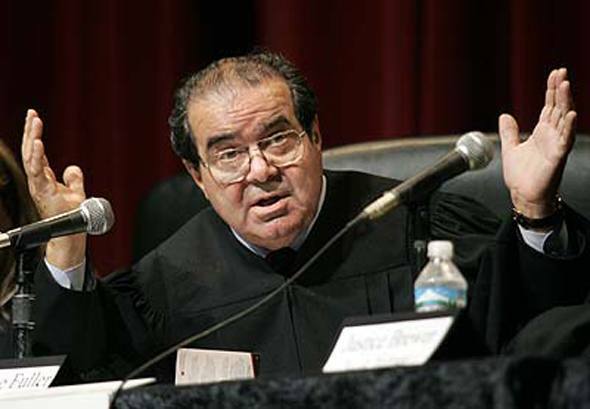 (AP) -- Supreme Court Justice Antonin Scalia said Saturday the idea of religious neutrality is not grounded in the country's constitutional traditions and that God has been good to the U.S. exactly because Americans honor him. That’s right. I thought it was clear: the government doesn’t get to interfere in private matters of conscience. It’s a concept that really isn’t that hard to understand. There should be no federal bias in favor of Baptists over Catholics, or Christians over Muslims, or religious vs. non-religious — it’s just not their job. It’s worrisome that a Supreme Court justice thinks it is their job. Sure. It's right there in the Constitution. It's in the subsection on Baptists, Catholics and Muslims. Let's see, let me find it ... Uh, I could have swore ... Hmmm. We'll get right back to you on that.